In honor of National Pet Day, The Violet Files introduces some illustrious animal friends from historic Hollywood and beyond. Clooney had his pot-bellied pig; Audrey, her fawn. Even Bieber briefly enjoyed the company of a capuchin monkey. Indeed, since the Golden Age of Hollywood, stars have reveled in the friendship of animals. While we at The Violet Files don’t recommend attempting domestication of lemurs, lions, or any other wild things (try a house cat instead), we love to honor the loyalty and elegance of our animal companions. So in celebration of National Pet Day, we have compiled a dossier of some high-profile (and often highly unlikely) human–animal friendships of yesteryear, from the traditional to the outré. Meet a few of our favorites. How they met: On the set of Hepburn’s 1959 film Green Mansions, in which the fawn co-starred. The production’s animal trainer suggested Hepburn invite the baby deer home so it would bond with her. And bond with her it did, even attending parties at her side and famously accompanying her through the aisles of a grocery store in Beverly Hills. Stats: Dined on “pablum and milk” that Hepburn mixed and hand-fed from a bottle. Habitat: Slept in a custom-made bathtub at Hepburn and director husband Mel Ferrer’s home in Beverly Hills. Dozed in Hepburn’s lap while traveling in the family sports car. Siblings: Hepburn’s prized Yorkie, Mr. Famous, may or may not have been jealous of the fawn. Habitat: At home with Wood in Beverly Hills; the actress’s lavish dressing room on the Warner Brothers lot. Wood loved fashion, and “she enjoyed decking Chi Chi out in anything from jeweled sweaters to sailor hats,” her best friend, playwright Mart Crowley reports. How they met: In 1930, Henry Varna, owner of French club Casino de Paris, presented Baker with a live cheetah to feature in her dance routine. Baker was so taken by the big cat that he became her constant companion, traveling the world with her as well as sharing her spotlight. Stats: Wore a diamond collar. Earned a reputation of clawing at women’s legs. Diana Vreeland liked to tell a story of the time she went to a movie theater and discovered, when the lights went up, that she was seated next to Chiquita. Habitat: Onstage and everywhere else Baker went, including bed, Rolls-Royce, and international vacations, much to the chagrin of her manager-lover, Pepito. Siblings: Baker also had a pet spider monkey named Binki. How they met: Pulitzer Prize–winning author Louis Bromfield gave the canine-loving newlyweds their first boxer, Harvey, as a wedding gift when the pup was just one week old. This kicked off a love affair with the breed that soon led Bogey and Bacall to adopt two more boxers, Baby and George. However, Harvey was their favorite. Stats: Talented mediator. “He would sit between us if we had a fight,” Bacall said. Siblings: The animal enthusiasts were also the proud owners of some 14 chickens and 8 ducks. A dog devotee to the end, Bacall willed $10,000 to her pet Papillon, Sophie, when she passed away in 2014. How they met: Reportedly a gift from the Colombian head of state in the 1960s. Habitat: “On a silken setee located in front of a carved marble fireplace” in Dalí’s living room, per the writer Suzanne White; aboard luxury ocean liners; and at Le Meurice, where it escaped and “sent the guests...scurrying like rats for cover,” according to Carlos Lozano. Siblings: Babou was not the only exotic animal in the great Surrealist’s life: At one point he was spotted walking around Paris with an anteater on a leash. That said, he was much closer with the ocelot. How they met: On a trip to Africa, Hedren and her husband, Exorcist producer Noel Marshall, became fascinated by big cats, and were inspired to make a movie about a family that lives with them. Back home, Hollywood animal trainer Ron Oxley advised the pair to try living with a lion to prepare, and introduced them to the African-born Neil. Stats: Clocking in at 9 feet long and 400 pounds, Neil dined on up to 12 pounds of meat daily. Erstwhile actor on 1960s TV show Dakari. Habitat: Neil had full range of the family’s Sherman Oaks house, and preferred to sleep in Hedren progeny and actress Melanie Griffith’s bed. Hedren has admitted this was a bad idea. Siblings: At one point after Neil, Hedren and family had six lion cubs living in the house. The cubs were not as well behaved as Neil. How they met: A proper British pet and the first of Hitchcock’s beloved Sealyhams (see below), Mr. Jenkins accompanied the director and his family when they moved to Hollywood in 1939. Stats: A 1939 LIFE magazine feature described an affinity between man and beast: “Pudgy little Alfred Hitchcock...somewhat resembles his Sealyham Terrier, Mr. Jenkins.” Hitchcock’s terriers dined “better than most people” on choice cuts of meat he selected from the local butcher. Siblings: Hitchcock would go on to acquire three more Sealyhams: Geoffrey, Stanley, and Sarah. Geoffrey and Stanley made a cameo with their master in his iconic film The Birds. 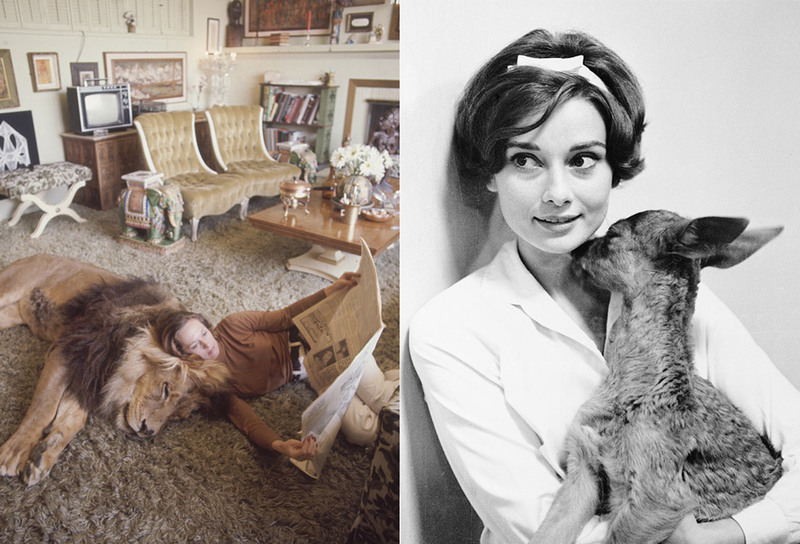 Peruse more classic pictures of fawn owner and eternal VIOLET GREY inspiration Audrey Hepburn.